Great find/ fits my small table perfectly ; no hang down for pets to grab. 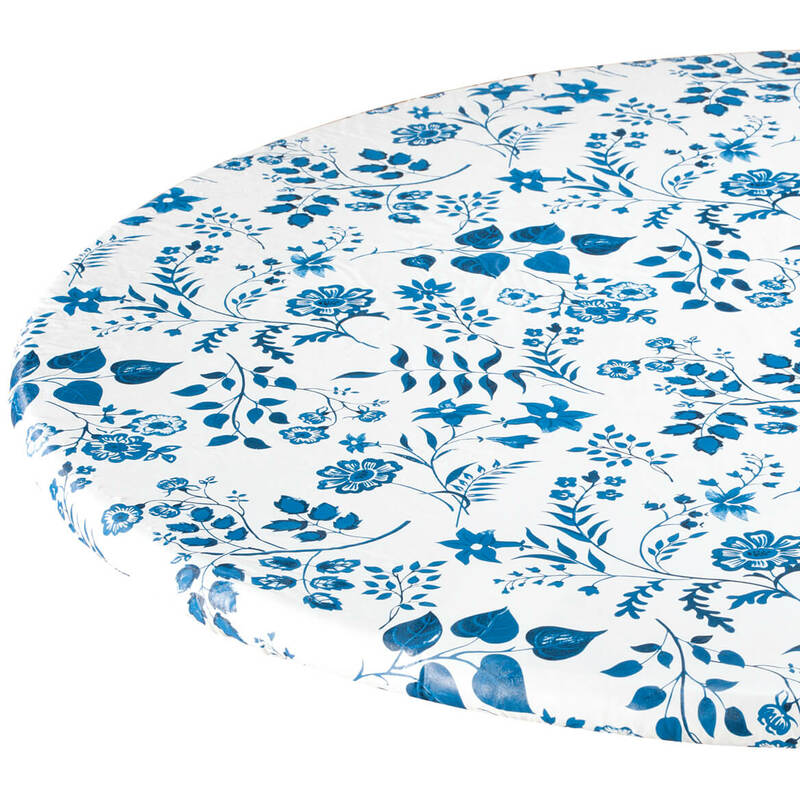 I had bought an outside table for my patio and the paint on the table started to chip-- this was not a cheap table -- so I told my husband I am going to buy an elastic tablecloth-- and I did and I really love it-- so not I can use this table all year long if I choose to. LOVE IT! 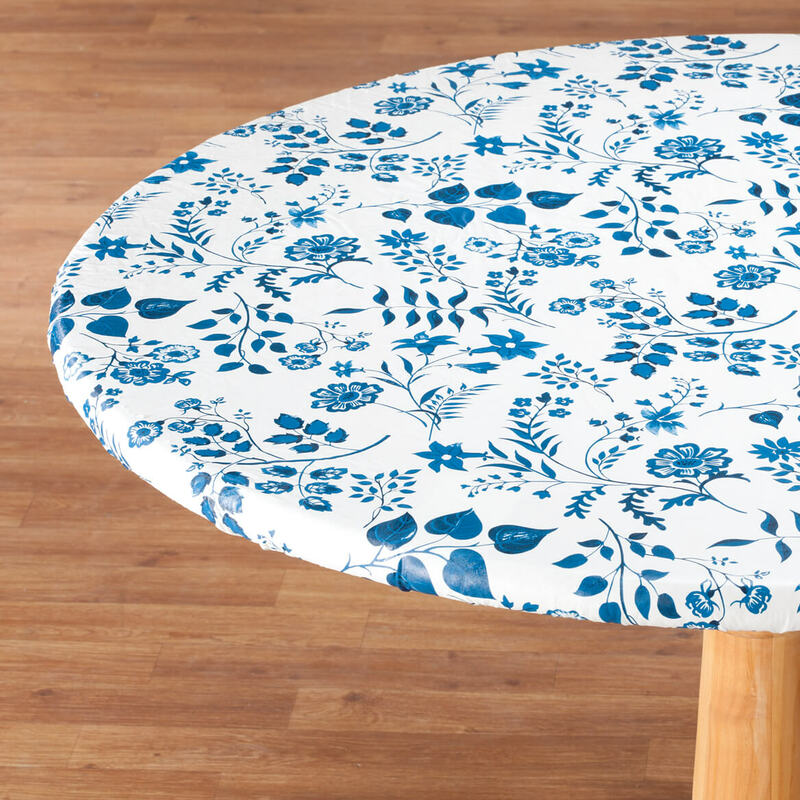 GORGEOUS BLUE FLORAL PRINT AND IT STAYS PUT! Someone said it arrives too wrinkled to use. It is true that it needs to be placed in a clothes dryer with some damp towels on low heat for a few minutes. That takes the wrinkles right out. If it is still a tiny bit wrinkled when you put it on the table it will straighten out in a few days. I've had this type of tablecloth in the past, but they were always too big. Love this one! I would buy this product many times, cause its a very good. Perfect!! I love this table cloth. I have been looking for the right one for a while, and finally found it. 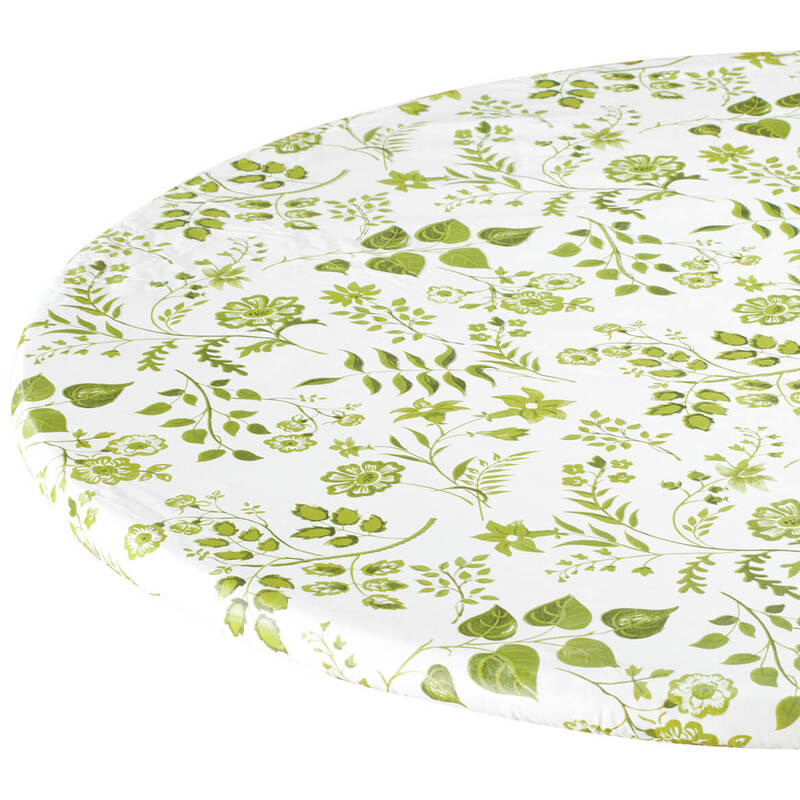 I just received this tablecloth; very pretty with varied shades of moss green on a white background. Wrinkles disappeared in about 3" on medium setting in dryer. Easily fits my 45" table. The vinyl is much heavier than the one I just removed(not from Miles Kimball). Nice flannel backing.I am very pleased with it and plan to order another one. Love the elastic it doesn't slide all over your table, stays where it is suppose to be. Wish there where different holiday ones. we used this cover in our kitchen. 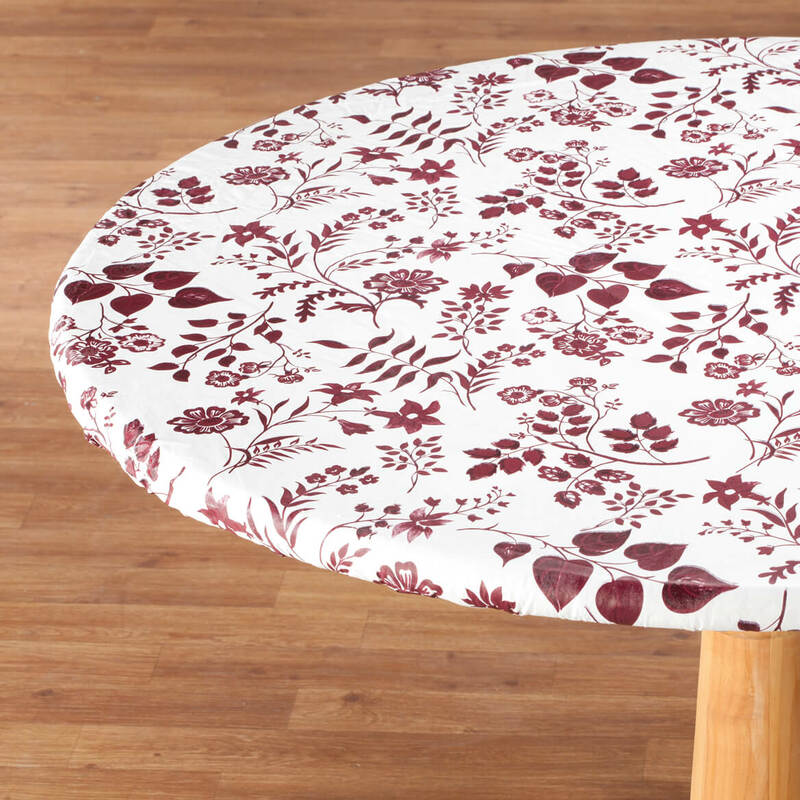 it is great for the service of a workable table cover. this is the forth one I have purchased. I love it for covering my table. Good table covers for the price. Buy the right size and they fit snuggly in place. Will not slip. I bought this for my kitchen table. It is a little too big but works ok. The fitted tablecloth arrived very badly wrinkled and since its vinel I dont think I can iron it. I like the color so I kept it. I hope that the wrinkles will come out over time. 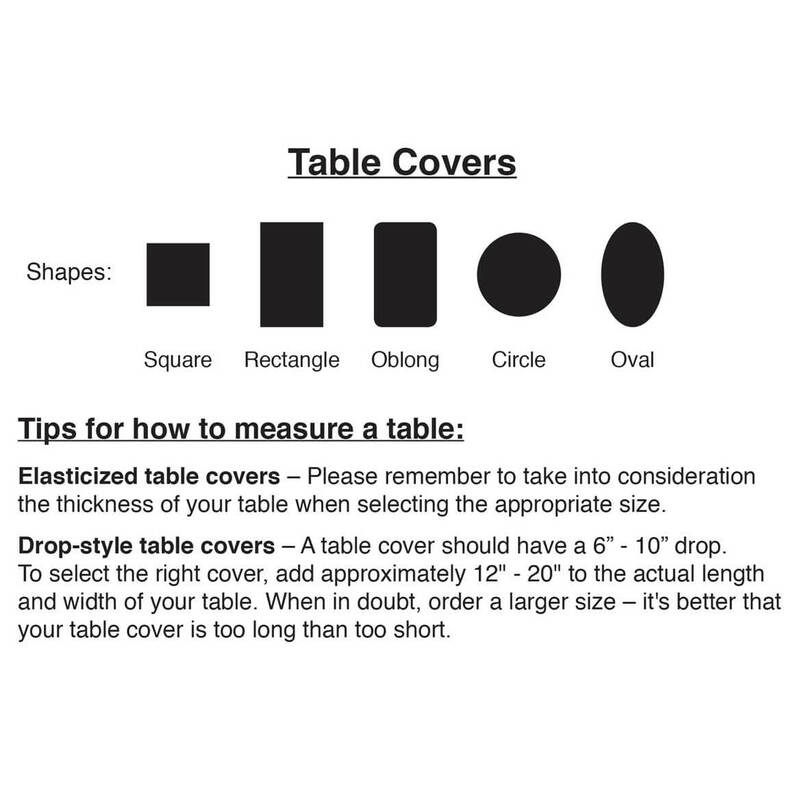 This table is advertised to fit both oblong/oval, and rectangular tables. While the size was correct it did not actually fit my rectangular table. Have bought these before and like,and was on sale. 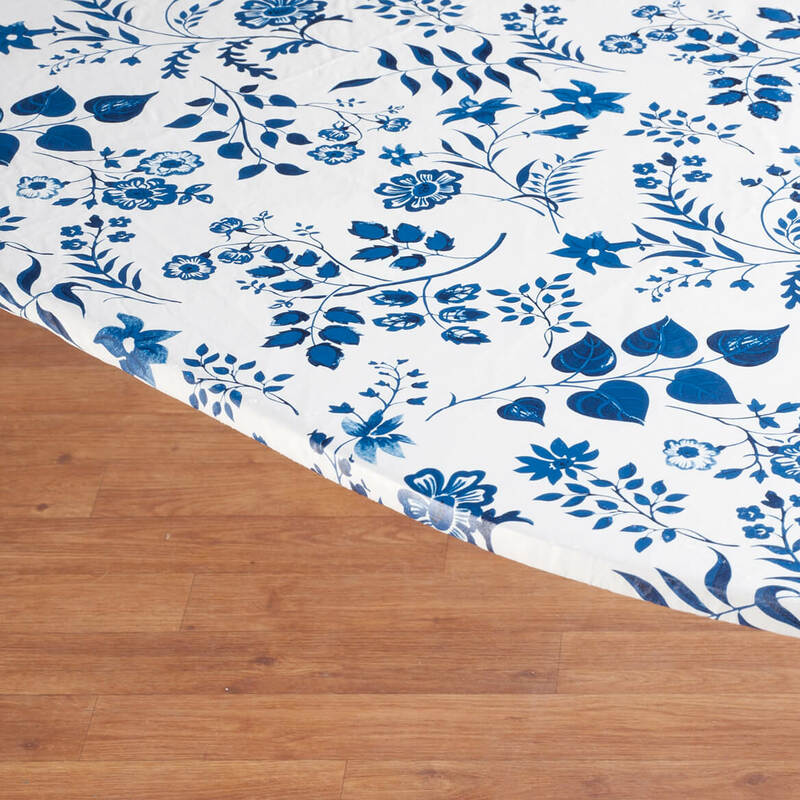 Miles Kimball is the onlu place I have been able to find these tablecloth covers in the size I need...other sites only offer the one size. Really great product. 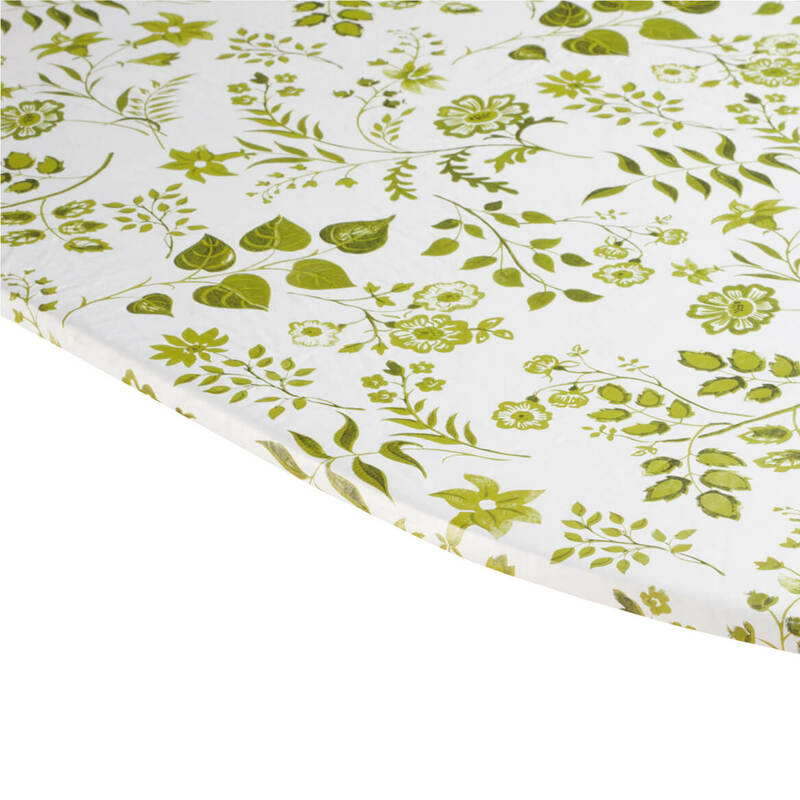 I have ordered these tablecloths for years! they are the best. The quality is outstanding, they fit great. I don't have to worry about them sliding off or getting dirty. I love them. Replacing one of my older tablecloth love the elastic style the vinyl works well and my table is always ready for a meal. Need for my kitchen table and the design will match my wall color. It's bright, it's blue and the pattern is intriguing. I love the elastic tablecloths! I need new ones and thought this was very pretty. It will look great on my kitchen table. My friend uses them and I like the look of them. Looks really nice, will work good in kitchen!!! I need elastic cloths so my puppies won't pull on them. I like that these tablecloths have elastic to hold them in place. Looks great on my patio table on my porch. Harmonizes with Blue Onion/Blue Danube dinnerware pattern. Fits my folding round extra table. Harmonizes with the Danube Blue Onion pattern porcelain ware. This is for my dad's outside table and he likes flowers. Only place that I have been able to find this size of round table cloth for our porch table. 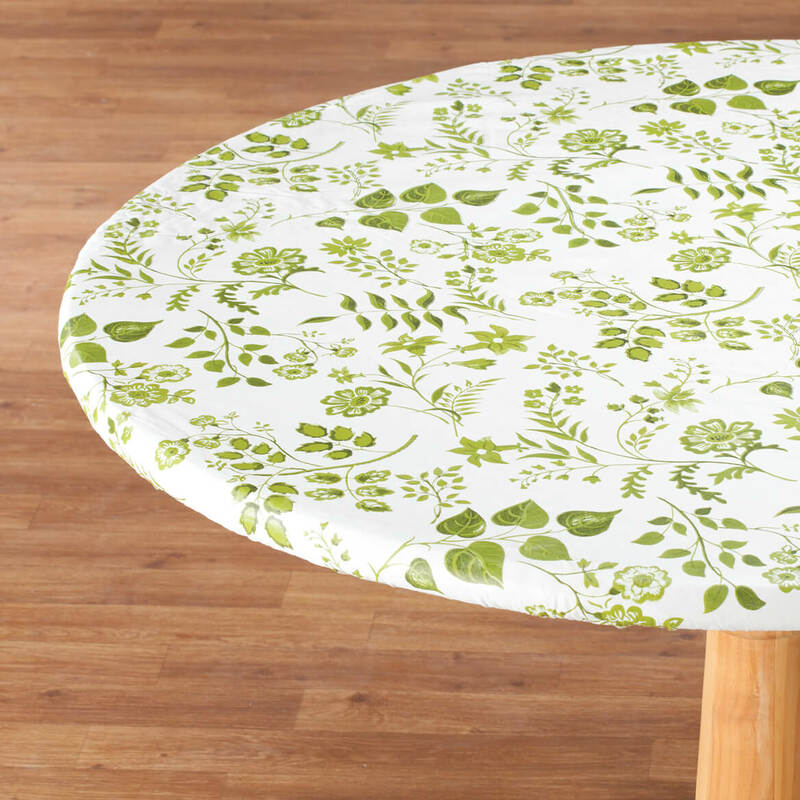 Have been using Miles Kimball for years for these table coverings. Because most others aren't very good looking patterns and this one is really great and comes in 3 colors. I have 2 tablecloths that need replacing and I didn't know where I got them. Went on the computer and your website popped up and it was just what I wanted. Thank you. My round table without the leaf is 48" so these fit nicely. Because we have a pet cockatiel and the table is his when he's out of his cage. This table cloth is easy to clean and it works for all of us. I have ordered your tablecloths in the past and they are always nice. I have a table on my deck and wanted a cover for it. The elasticized cover keeps it covered and I don't have to worry about it blowing off in the wind. Do you have any that would fit a 42x42 square table? BEST ANSWER: Thank you for your question. Unfortunately no this would not fit a 42x42 table. We hope this information will be of help to you. 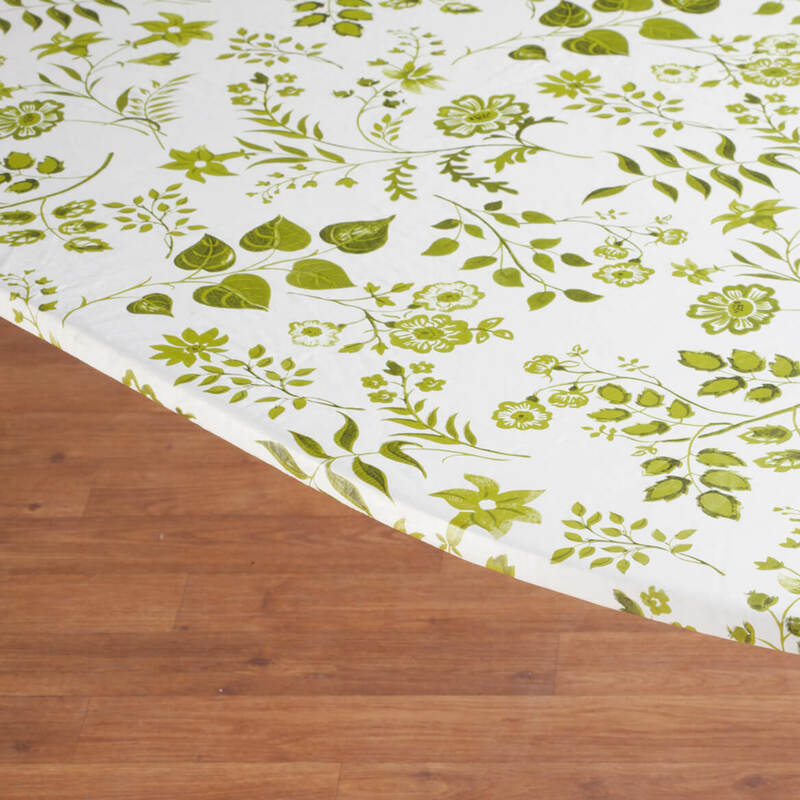 I recently ordered a 42x 68 Oval/Oblong elasticized table cloth and was not satisfied with the fit. I ordered one previous to this is and it was listed as only oval. This one has excess material around ends of table to provide coverage for an oblong table. I have an oval table and this one has excess material that is not satisfactory. Wish I cold get one like the first one I ordered. Do you have any other that is specific for OVAL? BEST ANSWER: Thank you for your question. 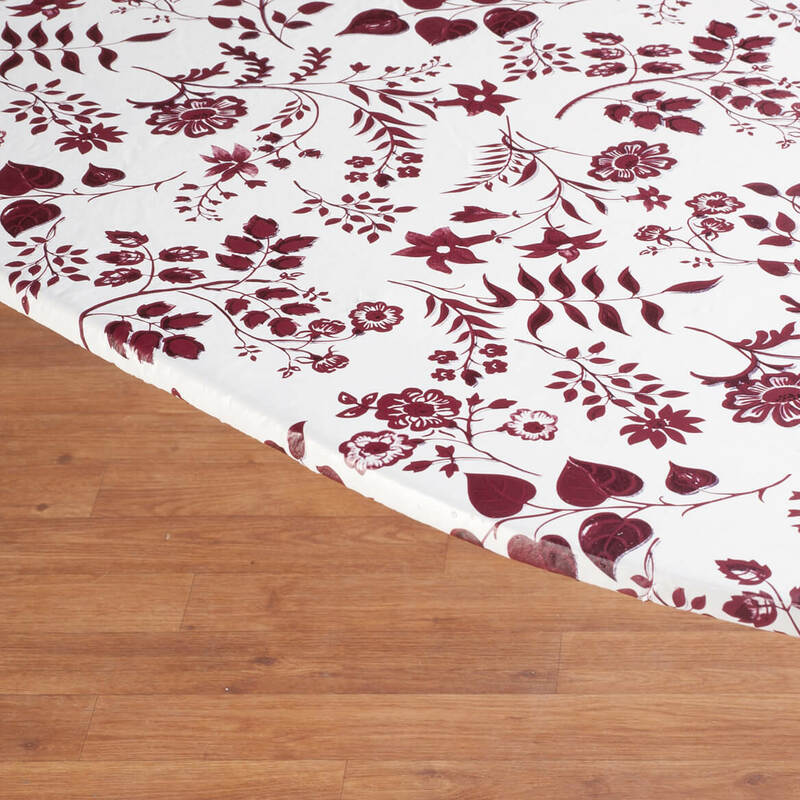 We suggest item 344989, Paisley oval table cover measures 42" x 68" . We hope this information will be of help to you.